The New Haven Police Department is mourning the loss of one of its own after an officer was killed in a motorcycle accident in South Carolina Saturday. 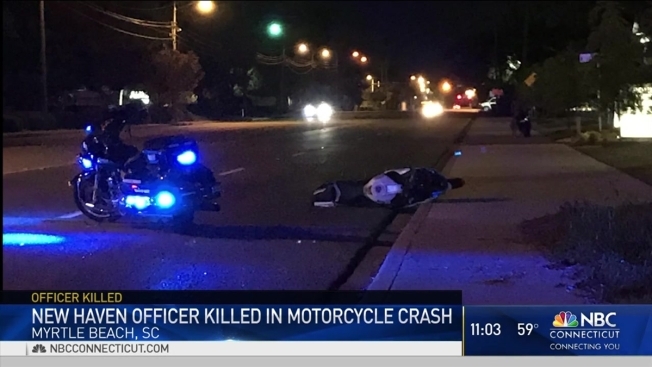 Officer Edward Douglas was riding a motorcycle when he was involved in a crash in Myrtle Beach, South Carolina, around 4:20 a.m. He died of his injuries at 9:25 a.m. He was 31. Police said no other vehicles were involved. Douglas began his basic training with New Haven police in January 2013. He was assigned to the Community Patrol Division upon graduation. In 2016, he moved to the Investigate Services Division, where he worked in the Narcotics Unit. “By everyone’s account who worked with him and supervised him in different roles in the police department, just someone who was constantly smiling, someone who was diligent with his work, left no stones unturned. He was a great police officer,” said New Haven Police Officer David Hartman of Douglas. Hartman said that Douglas was on vacation at the time of the crash and described him as a motorcycle enthusiast. “The news of Officer Douglas’ death has shaken New Haven’s 497 member department, of which he was a valuable and highly respected member. There is a great emptiness left by Edward’s passing. Edward’s family must know that the outpouring of love they have and will continue to receive will serve as a reminder to them of how much he was loved by all who knew him,” read a release from the New Haven Police Department. Douglas is survived by his mother, father and three brothers. “We are not his immediate family. We are his second family. This is something that has shaken us to the core,” Hartman said. Counseling services are being offered to officers and to his family.